Decked out for the ''Pretty In Pink'' show at the Stanthorpe Golf Club - from left, Nikki Waterworth, Helen Jones, Kay Webb and Linda Kelly. 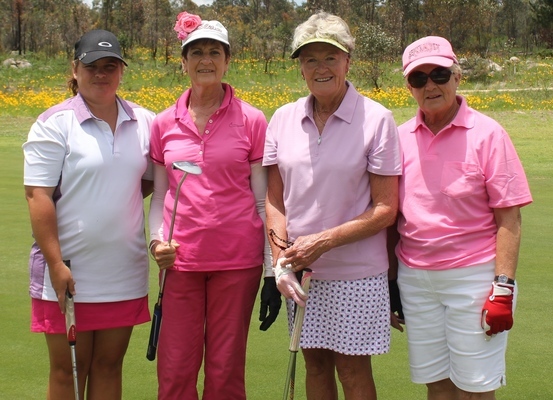 The weather forecast for Stanthorpe last Saturday was not looking rosy but there were 50 local golfers keen to get the show on the road for the Pretty in Pink – Breast Cancer Research Day sponsored by the Heritage Bank and supported by the staff of the local branch. The annual event which is a player favourite was postponed earlier in the year due to wet weather so organisers and players were pleased when the forecast rain held off until well after play. While the golfers battled it out on the course in the Single Stableford competition the Heritage Bank girls were kept busy on BBQ duties, selling raffle tickets and distributing prizes. Overall more than $1000 was raised and will help support those in the local community affected by Breast Cancer. The Pink theme flowed throughout the day from dress to buggies specially dressed for the occasion and there were prizes for both. It was hard to miss Eric McClelland who was happy to forgo his much loved Manchester Blue for a flurry of pink and he was rewarded with the prize for the most “appropriately” dressed male only just edging out Bill “Pinky” Pyne. Lorraine Gurnett was “pretty on pink” and got the nod in the Ladies category. It was hard to miss the Fittock’s mean Pink Machine which won the prize for the best decorated buggy. The McLellan’s wheels receiving honourable mention. There was golf played as well and there were some remarkable scores returned. Matt Burgess was in red hot form and the scorched the field with a score of 48 points in the men’s event. Burgess finished the round six shots clear of Santo Cavallaro who claimed second spot after a count back relegated Ian Harvey to a place in the run downs. Marg Locke returned 42 points in the ladies competition finishing an amazing seven points ahead of the field. Kay Webb (36) collected the runner’s up prize. Following the round there are quite a few players who are under the handicapper’s scrutiny. The run down went to 40 points for the men and 34 for the ladies. The colour scheme this Saturday will possibly be a little more sedate but the competition will be equally as fierce when the field tees off in the Delaney Family Golf Day, a medley 4BBB Stableford. This event is a shot gun start commencing at 11.45 am with registration to be completed by 11.30 am.